Because they don’t offer typical traditional videogame-y interactivity, so-called “walking simulators” live and die by the strength of the story they tell and the world they let you explore. If one, or better yet, both can draw you in, then the game can be just as compelling and fun as any action game or shooter. You have to let yourself be absorbed into the experience, though, which it seems not all players are willing to do quite yet. For me personally, I’m already all aboard the walking sim hype train, particularly when they feature themes and settings I can personally relate to like in Firewatch. I live in Idaho where I’m ten-minutes away in any direction from the great outdoors. I love nature and fishing and hiking and exploring. And I’ve even been to a real fire lookout on top of a mountain before. It was basically coded into my DNA that I would enjoy Firewatch, but the characters and story and incredible presentation are what really made me fall in love with it. Firewatch isn’t just good “for a walking sim” it is a great game overall and one of my favorite experiences of 2016. See all of the details in my full review. Firewatch takes place in the Wyoming wilderness in the summer of 1989. You play as a rookie fire lookout volunteer named Henry who took the job to get away from his crappy personal life back home on Boulder, Colorado. After a brief tutorial where you learn about Henry’s past, and even make a couple of role-playing decisions that help set the tone for your Henry’s personality for that particular playthrough, you’re dumped on top of a mountain to be alone with your thoughts. You aren’t alone, however, as another lookout across the valley by the name of Delilah, who also happens to be your supervisor for the job, is in constant radio contact with Henry. What starts out as being mildly annoying with Delilah constantly radioing you to chit chat – kinda like Otis in Dead Rising – you soon start actually looking forward to your conversations with her. After just a couple in-game days on the job, you, both as the player as well as Henry the character, genuinely care about what Delilah has to say. She’s clever and fun to talk to and her reactions when you report seemingly simple things are a real highlight of the experience. You get to choose what to report to Delilah, as well as other things to talk about – namely Henry’s past – and you really become attached to her. Henry’s time on the mountain isn’t all just fun conversations with a mystery woman across the valley, however, as there is work to be done as well. The mundane task of checking on some people setting off illegal fireworks sets the real plot into motion and a mystery starts unraveling before you. I don’t want to spoil anything so I’ll leave out the specific details, but Firewatch takes some fascinating turns and features one of the most goosebump-y moments I’ve felt in a game in years. Some might complain the ending is a little anticlimactic and plain, but I think you get a thoroughly reasonable and realistic conclusion that suits the game fairly well. The game is fairly grounded in realism, after all. 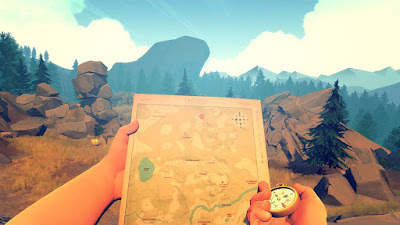 Gameplay-wise, Firewatch is a first-person game where you can explore a decently sized chunk of mountain wilderness. You can’t jump or really interact with much, but you can climb up and down rocky paths, look at lots of pretty scenery, and eventually find equipment that lets you clear brush, take pictures, and rappel down (and climb up) steep cliffs. My favorite aspect of Firewatch is that it doesn’t really tell you how to get anywhere. Instead you have a map and a compass and have to figure out how to get around on the mountain on your own, which is awesome. Truth be told, there isn’t really much to do in Firewatch. You basically go where Delilah tells you investigate stuff and that’s it. There are some supply boxes you can open up and a handful of things scattered around tied to achievements, but not much else. The focus here is on moving the story forward, and I’m fine with that. If you do want to wander around and explore you do have some free time during the story, but you unlock a free roam mode once you beat the game so I suggest waiting to do too much exploring until after you finish the story. I want to note that it isn’t as if you’re on a time limit or have to rush through the story, so you can dink around and explore if you choose, but I was so immersed in the story that I wanted to see it through ASAP. Not having much to do doesn’t make Firewatch boring, though. Well, maybe it’s boring if you don’t enjoy peace and quiet out in nature, but I felt right at home here. There are lakes and streams and waterfalls, rocky canyons, pristine meadows, dense forests, and more just waiting for you to explore and it is all beautiful and worth seeing. Firewatch does a fantastic job of putting you out in nature in the middle of nowhere and I love it. Do I wish there was more stuff to do? Yeah, I’d be lying if I said otherwise. 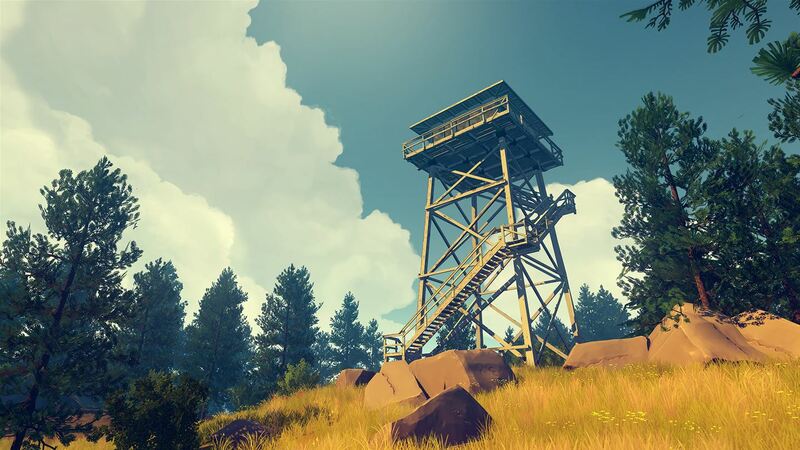 But what you do get to do in Firewatch is still very compelling and very fun. The presentation plays a huge part in bringing everything in Firewatch together. The visuals are stylized and not realistic, but it still looks natural and beautiful and wonderful. The lighting also deserves a shout out as you play during multiple different times of day, as well as in the middle of a huge cloud of smoke (because, yes, a forest fire does happen in this game about looking out for forest fires), and the way the lighting changes how the world looks is incredible. The sound is also very well done in Firewatch with great ambient sound effects for wind, water, and animal sounds that really make you feel like you’re in the wilderness. Voice acting for Henry and Delilah is also masterfully done and you really feel the tension, joy, frustration, and relief in their voices. Rounding things out is a great soundtrack that where every piece of music perfectly suits the atmosphere of the moment you hear it. The only negative about the presentation is that the game has somewhat choppy performance where it will stutter and lag for a half-second when it autosaves or loads. Or something. It doesn’t affect the gameplay whatsoever, but it is definitely a drag that the experience isn’t more smooth and seamless. Ultimately, your enjoyment of Firewatch is going to come down to the two things I mentioned at the top of this review – how invested you get in the story and characters, and how much you enjoy the wilderness setting. And if you need a game to let you kill stuff or be full of collectible junk for it to be fun, Firewatch probably isn’t for you. 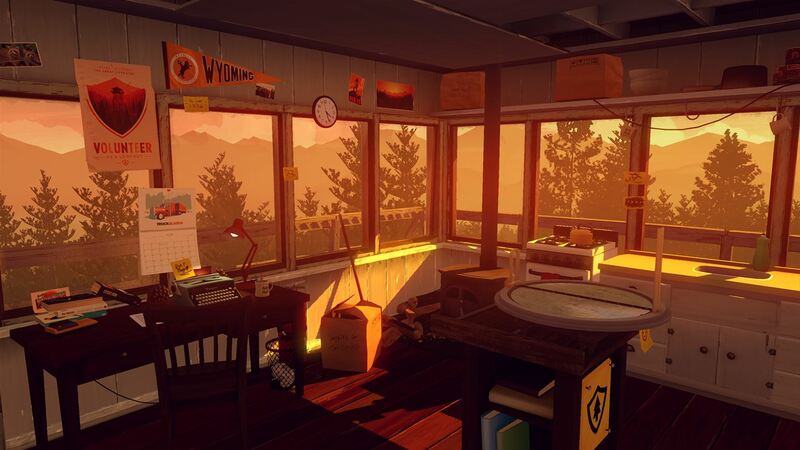 Personally, I found almost everything in Firewatch to be fun. Talking to Delilah is fun. Exploring the wilderness is fun. Adopting a turtle is fun. Watching a fire burn off in the distance is fun. Playing through the story to figure out the mystery is fun. Firewatch costs $20, which may seem a little steep if you’re one of those that don’t consider it a “real game”, but I’m pretty comfortable with the price point. It only takes around 4-hours to finish the story, but I think it is worth playing at least twice to change up your conversations with Delilah a bit. There is also the free roam mode as well, which will be fun to play around in for a while. Firewatch is such a great, highly polished overall experience, though, that makes it easily worth the price of admission. I loved every second I spent with Firewatch and highly recommend it for a purchase.